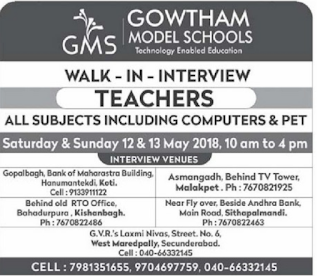 Gowtham Model Schools, Secunderabad has advertised in Eenadu newspaper for recruitment of Teaching faculty jobs vacancies. Interested and eligible job aspirants are requested to walk-in 12th & 13th May 2018. Check out further more details below. Name of the School : Gowtham Model Schools, Secunderabad. 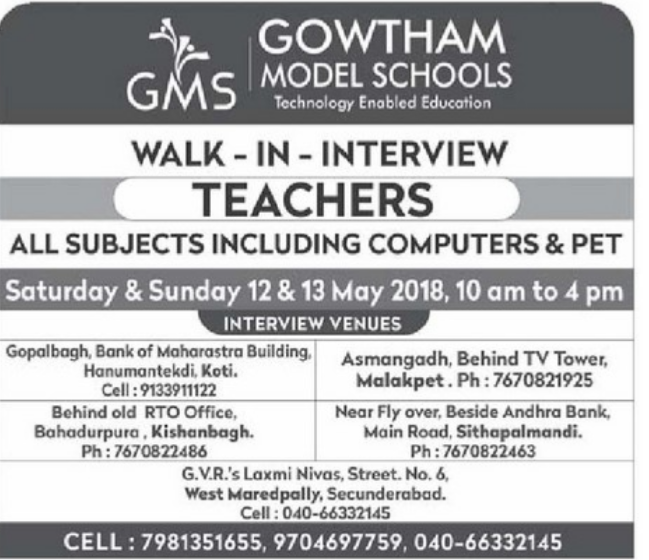 About School: Gowtham Model School (GMS), promoted by Sri M. Venkatanarayana and managed by Sri Gowtham Academy of General & Technical Education, is one of the biggest names in the educational services sector in Andhra Pradesh and Telangana. GMS has been ranked as one of the largest group in terms of number of schools and students. The academy currently has 60 schools with a combined student population of approximately 45,000+. Job Location: West Marredpally, Secunderabad. How to Apply:Send resume to below mail id. Last Date: Walk-in 12-05-18,13-05-18. Between 10 am to 4 pm. Reference: Advertisement on Eenadu newspaper Dated 11th May 2018.